Those that participated lost a significant amount of weight even though no other dietary changes were implemented. Just as the body needs its portions of macro and micro nutrients daily, it also needs and requires a healthy dose of fiber. Fiber (known as roughage and bulk) is either soluble (because it dissolves in water) or insoluble (it does not dissolve in water). It includes the parts of plant foods that your body is unable to digest or absorb like it does with fats, proteins and carbohydrates. Fiber simply passes through your stomach and intestines and out of your body. Soluble fiber: This kind of fiber dissolves in water and forms a gel-like substance. It helps lower blood cholesterol and glucose levels. You can find this type of fiber in legumes (peas), oats, apples, citrus, barley and carrots and a whole lot of other foods. 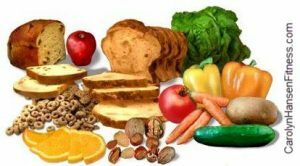 Insoluble fiber: This type of fiber increases stool bulk and promotes the movement of food material through your digestive system. Highly beneficial for those suffering from constipation or hard and irregular stools. Nuts, beans, vegetables are great sources of this kind of fiber. Plant based foods such as beans contain both insoluble and soluble fiber although the amount varies in each one. It provides zero calories but takes up space in our stomach making us feel full. You’re likely to eat less and stay satisfied longer. High fiber foods generally take longer to eat and have less calories for the same volume of food. Fiber also helps to normalize stools. Loose stools benefit from fiber because it is able to absorb water and adds bulk. It also softens and increases the weight of your stool so it is easier to pass. Getting more fiber into your diet is not hard to do. Why not start by adding more fiber to your breakfast meal. Add unprocessed wheat bran to your favorite cereals (always opt for those with “whole grain, bran or fiber” listed). Make every snack count. Fresh fruits and veggies are your best choice for fiber but you can also enjoy an occasional handful of nuts or seeds (just be aware of the calories). Be aware. When adding fiber to your diet, don’t overdo it. Add a bit at a time and spread your increase out over a few weeks to avoid intestinal gas and abdominal bloating from adding too much too quickly. Allow the natural bacteria in your digestive tract to adjust to the changes.